Governments discuss and negotiate common goals around the causes and consequences of climate change under the United Nations Framework Convention on Climate Change (UNFCCC). Since 1992, industrialised countries have pledged new and additional funding to developing countries to help them meet their climate-related obligations, as stipulated by the UNFCCC. The UNFCCC’s Standing Committee on Finance (SCF) has recently made its first Biennial Assessment of Climate Finance Flows Report (BA). The highlights of this report are outlined here for the benefit of government decision-makers. In Cancun in 2010, the UNFCCC set the goal of limiting global temperature increases to no more than 2 degrees Celsius above preindustrial levels. To achieve this goal, the mobilisation of significant public and private capital for climate-friendly investments and capital reallocation from high-carbon to low-carbon technologies are required. This climate finance goal has been – and remains – a focal point of the international climate negotiations. Industrialised governments made a specific commitment to increase their flows of climate finance to developing countries to US$ 100 billion per year by 2020. For such commitments to be meaningful, it is essential to be able to measure the extent to which (i) developed countries fulfil their financial obligations; and (ii) disbursed funds achieve their intended results, i.e. whether the funds are effectively and efficiently deployed in mitigation and adaptation activities. Thus, tracking the delivery of commitments and completing the picture of the climate finance landscape is an essential step towards achieving the 2 degree Celsius target. Such an endeavour requires a clear picture of how much and what types of support are being made available, how the support corresponds to countries’ needs and goals, and whether financial resources are being spent productively. All of these points are critical for improving transparency, thereby building trust among countries and ensuring the effective use of available financial resources. In 2010, the Conference of the Parties (COP) decided, as part of the Cancun Agreement, to establish a Standing Committee on Finance (SCF) to assist the COP in relation to the financial mechanism of the Convention.1 One of the mandates of the SCF is to assist the COP with respect to Measurement, Reporting and Verification (MRV) of the support provided to developing country Parties, by means of activities such as the preparation of the Biennial Assessment and Overview of Climate Finance Flows Report.2 The aim of the BA is to provide the COP with existing information on financial flows against the background of the objectives of the Convention by reviewing existing literature and to provide recommendations to strengthen the methodologies for reporting on climate finance.3 The purpose of this paper is to provide a short overview on the findings of the first BA and the recommendations of the SCF to the COP. It will also provide some brief thoughts on how the identified recommendations can support future international negotiations. Assuming the role of a technical committee, the SCF had the declared goal, with the BA, to present the status quo on climate finance. 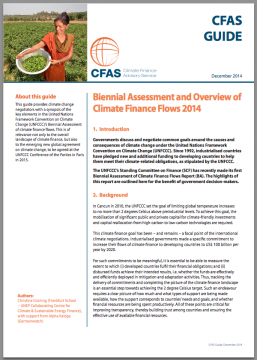 The scope of the first BA is to focus on climate finance flows, definitions, and methodological aspects. Based on the current literature, the first BA provides a clear and comprehensive outline of the current status of climate finance within the existing data limitations. The BA was aimed to be technical rather than political in nature, enabling the SCF to elaborate conclusions and recommendations for consideration by the COP based on its data and analysis. These conclusions and recommendations aim to facilitate an informed discussion and provide a basis on which the COP can make decisions with all its authority. The objectivity of the BA is of great importance, as politicising the BA could provoke the old and typically less constructive debate about the balance of the 20 members and the extent to which they are fully representative of the authority of the respective country groups. The SCF recommendations highlight the importance of improving the climate finance landscape by working on a common operational definition of climate finance and the measurement, verification and reporting of climate finance flows. A more comprehensive and complete picture of the climate finance landscape is essential to track the progress towards achievement of both the 2 degrees Celsius target and the delivery of the commitments. For future BAs it would be important to place climate finance in a broader context. It may be of interest to compare the issue of climate finance to globally aggregated financial flows in other areas, such as fossil fuel-based energy investments. Putting climate finance into a broader perspective with - a look toward the 2 degree objective of the Convention - would help the world transition to a climate-wise sustainable path. The recommendations of the SCF to the COP could enable the enlargement of the BA’s scope in the longer run. The SCF will need to discuss whether the BA is the appropriate mechanism by which to tackle these limitations and constraints. Further, based on the experiences of the first BA, the COP may wish to amend its mandate to the SCF for future BAs. The implementation of some findings, however, requires the cooperation of institutions beyond the UNFCCC, including governments, development finance institutions, research institutions, NGOs, the private sector, and for the sake of efficient international data collection and management, certainly the OECD. It will be interesting to see how the COP will use the first BA and the recommendations of the SCF. It seems, however, that there is an important role for a body under the UNFCCC that is attempting to collect and provide information at the UN- level to inform the discussion prior to the commencement of political negotiations. This may be one way to improve upon the often-perceived inefficiency and inefficacy of negotiations and decision-making at the UN level.